First two elements belong to the Hana instance. Data Provisioning Agent is a part of HANA Agent installation and it should be downloaded separately. Depending on the customer requirements and technical settings we may need to customize a few steps. First of all we need to define a dataflow and then apply all other settings. In this example we will describe a dataflow from HANA DB table to ORACLE DB. This case is rather specific and it demands some additional actions. 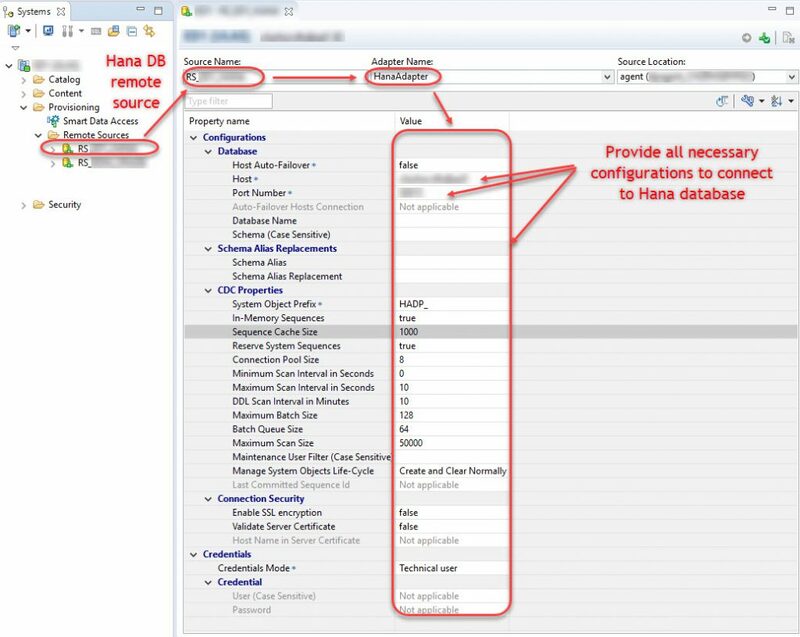 In your HANA Studio or Eclipse select corresponding system and in the folder called Provisioning new remote source should be created for your Oracle system. Here we’ve selected – OracleLogReaderAdapter. 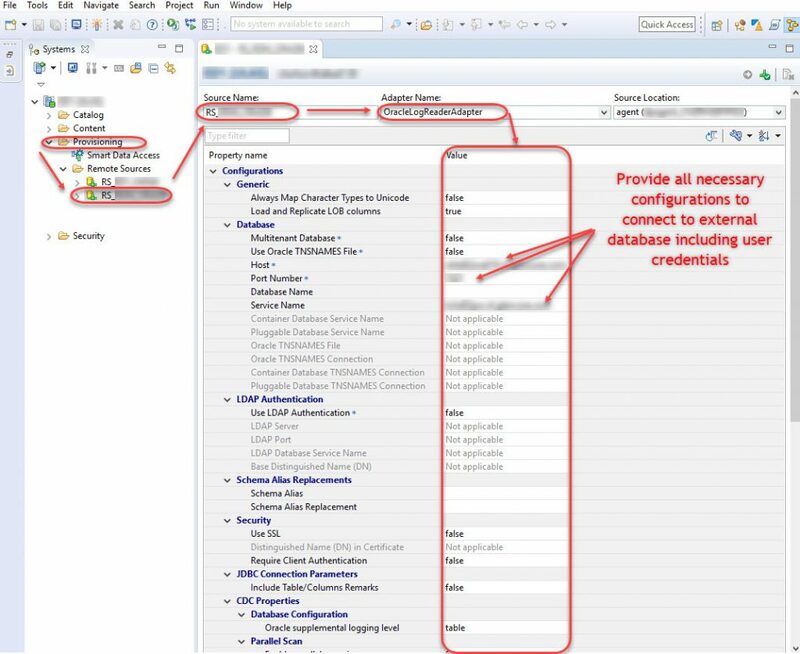 In the next step we should create another Remote Source with system based on HANA DB. In this case HanaAdapter was used. Data Provisioning Adapter acts like a bridge between two remotely connected systems, in our case HANA DB and ORACLE. The second step is a virtual table creation. In order to transfer data from HANA database tables to particular ORACLE database table we need a virtual table created in our HANA system based on ORACLE table which we have in our Remote Source. On the HANA Remote Source side we have created corresponding table which we can use for further data transfer. SAP HANA Web-based Development Workbench is a very flexible environment which allows to see all the objects created in HANA studio or Eclipse and it has a wide range of tools which make data provisioning process intuitively clear and rapid. In case you’d have any questions about SDI please feel free to comment under the blog. SAP Experience:SAP ABAP technical consultant since 2012. Involved in solution implementation projects in various modules PS/SD/FI/CO/MM. Experienced in wide variety of SAP development including SAP standard, migration and integration technologies including Fiori, OOP ABAP, ABAP for HANA, HCP, SDI, OData, AIF, SLT, IDOCs, BAdIs, BAPIs, Smartforms and Data transformation. Thanks for the nice blog. Are there series of blog available from your side to learn SDI. Thank you very much for the interest. I will continue SDI topic here.